“It ain’t how it used to be back in the old days”. Such a general, ambivalent statement, yet it rings true for Skyclad, one of the folk metal pioneers. In the 90s, the Newcastle bunch pumped out a record every year, pumped with fairly consistent quality and heaps of lyrical wit. After Martin Walkyier, the lead vocalist and iconic lyricist left the band, their pace slowed down (though quality was maintained) for an acoustic compilation and two more studio albums. Forward Into The Past marks the band’s first album after 8 years and it undeniably sounds like Skyclad, except that things… just aren’t the same. What used to be bouncy is still bouncy, just a bit less so. What used to be catchy is still catchy, just not quite as infectious. What used to be witty… you get the idea. 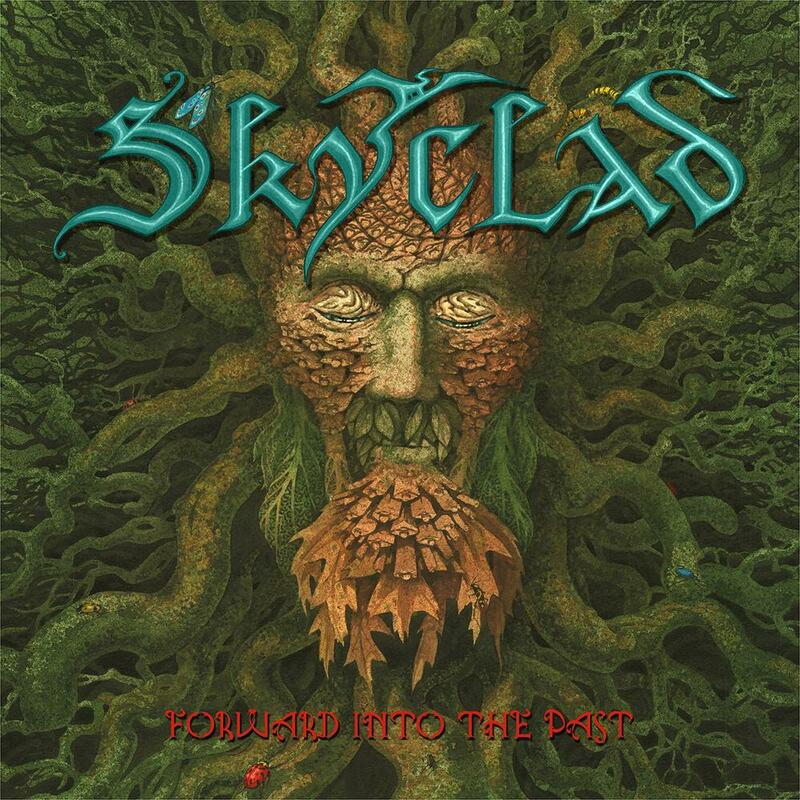 Forward Into The Past is simply the most by-the-numbers album Skyclad has ever recorded, and that is with some of the less inspired material form the Walkyier era in mind. Of course, Skyclad can bang out a dozen catchy songs with at least a few great melodies, but there is less depth than there used to be. The songs advance in a very straightforward manner, utilizing the verse-chorus approach for the most part, relying on melodic hooks and choruses, underlined by the mighty fiddle. Save the three interludes, the material can be divided into three brackets – the rockers, the folky tunes, and the ballads. The ones who fare best are the ballads – especially “Words Fail Me”, which throws in a simple melody that is recreated in various forms throughout the songs, as well as some very good, bitter lyrics. “Borderline” is a bit sadder, and enables Kevin Ridley’s sombre vocals to hit their melancholic best with tremendous support from the guitarists. Kevin does a tuneful job, yet doesn’t seem to have the will to use his aggressive voice too often, which added a little more soul to the previous effort. On the lyrical side, his work falls just below the ridiculously high Skyclad standard. Both some of the rocking and some of the folky parts are oftentimes rather forced. Whenever a big, catchy chorus is expected, the band just delivers it and tries to make it bigger and catchier rather than building up the tension. Take the catchy choral of another strong song, “The Queen Of The Moors”. It is well-done, but also represents main problem with the Forward Into The Past – there is room for so much more. Bass lines, acoustic sections, solo trade-offs, or just a seemingly random idea (remember how great the symphonic touches worked 15 years ago?). Only two songs break the 5-minute mark, a testament to the album feeling stripped down. Not all is lost, though. This is still the underrated Steve Ramsey, now with Dave Pugh to help him out, the guitars are executed very well. Cool little licks and riffs arrive, and though not as frequently, they definitely cheer a wayward folky soul up, They are sometimes so clever that they are hard to notice. The bluesy licks in the verses of “Borderline” or the opening speed-burst of the rocking and rolling “The Measure” do give the songs the sense of character others lack. Individually, the only other person that has a strong presence is Arron Walton with his dead-on sense of picking the right beat. All in all, just as the title track suggests, “in with the old and out with the new” rings true for Skyclad. Maybe more of a discrepancy between expectation and the final result than a lack of quality, No matter the reason, the return of the eternal underdog after 8 years does feel a bit lacking. No surprises to be found here, and the face staring at you from the album cover does not quite pop up when listening to Forward Into The Past. Their studio return is still quite enjoyable, but a bit of passion seems to be amiss. This entry was posted in Folk Metal, Heavy Metal, Reviews and tagged folk, folk metal, Skyclad, UK. From the strange country of Slovakia comes a metalhead and stand-up comedian. Living in Bratislava, he worked his way from Iron Maiden through a lot of thrash to a wide range of styles and bands. Even at 26, he has a strange knack for writing his own bio in third person.